Introducing people to the MBTI instrument is the highlight of my role at OPP. Friends question me if I’m bored training the same content over and over, but I’m still passionate and excited to do it. Every workshop is different, as every delegate comes to a deeper understanding of personality preference in terms of what it means to them, and experiences their own personal ‘light bulb’ moments. However, the danger with training the same topic is that we might lapse into our favourite or most comfortable ways of training, and not keep up with the latest thought leadership about how people learn. I imagine MBTI practitioners running team events or group feedbacks have the same challenge. There’s also an imperative from our customers to make training work for them, for example by having fewer classroom-based elements and less time away from their desks. I’m sure these trends apply to anyone working in learning and development, especially as organisations are looking increasingly for slick, modular sessions that they can fit easily into their working week. Never before has there been such a demand for L&D to be smart and high impact. Just as OPP is constantly working to refine and update the MBTI tool itself, here in OPP’s Learning Team we are passionate about helping people access type concepts using the latest thinking on how people learn. Specifically, we’ve been focused on developments in the spheres of multiple intelligences and accelerated learning. 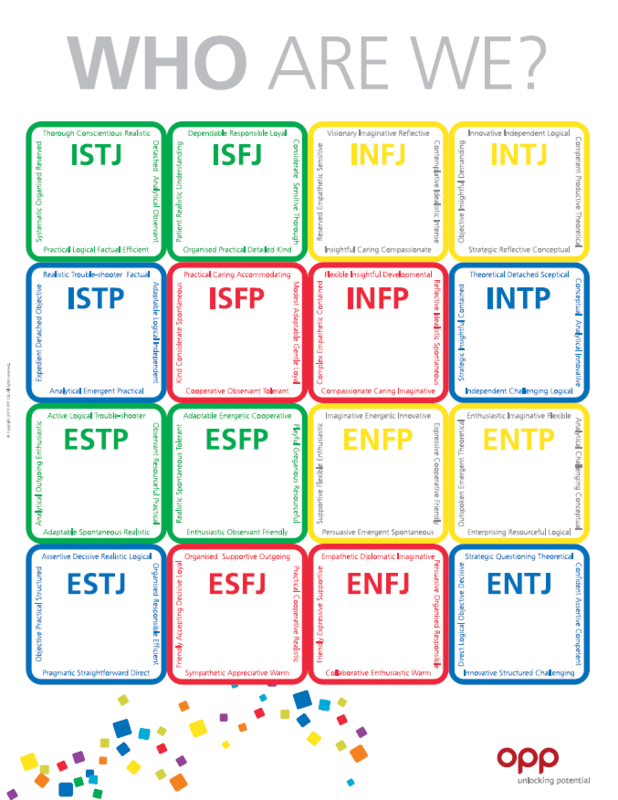 When it comes to the MBTI framework, it’s never been hard for us to convince people, once we get them into the room with us, that the concepts are highly relevant and useful. The challenge is addressing the ‘so what factor’ – the feeling that this is all very interesting, but what do I do with it when I get back to my office? We want people to be able to remember their four-letter type and preferences, and know how to apply these every day to make them more effective. Hence the sorts of new resources we’ve been developing to bring type to life with colour, imagery and physical learning aids such as Flip a Type Tip (my brainchild!). Keep in mind the layers of people, process and content – how will people interact? What structure/order will their learning follow? How is the content relevant to them? In the past year or so, OPP have come on something of a journey in incorporating this thinking into everything we do MBTI-wise. That’s why you’ll see more online learning on our workshops; interactive workbooks; visual and memorable ways for practitioners to explain the concepts; and exercises for group feedback that consciously adopt different learning styles. Our latest foray into this area is no exception – a series of colourful posters for you to use with your workshop participants to explain preference pairs, functional pairs and the zig-zag model of decision-making. Put these up round your training room to inspire the desire and create a learning environment. Engage multiple intelligences by combining colour, images and word clouds (visual and linguistic styles). Build in memory hooks by asking people to move round the room as you explain the concepts and run exercises (kinaesthetic style). Our aim here is to equip you to use the latest thinking from the L&D world, and we will continue in this groove in future. Making MBTI learning fun and memorable is my passion – and I’ll be using these new posters over the next few months with my course delegates. So, how about you? What interactive resources do you like to use, and what could we take inspiration from in future?